What an appropriate time to share with you a relaxed fit outfit of the day post, on a long weekend surrounded by chocolate and hot cross buns. I’ve mentioned my falling out of love with skinny jeans before, partly due to not finding the right fit and size for some time now and also probably due to a bit of boredom with the same uniform each day. 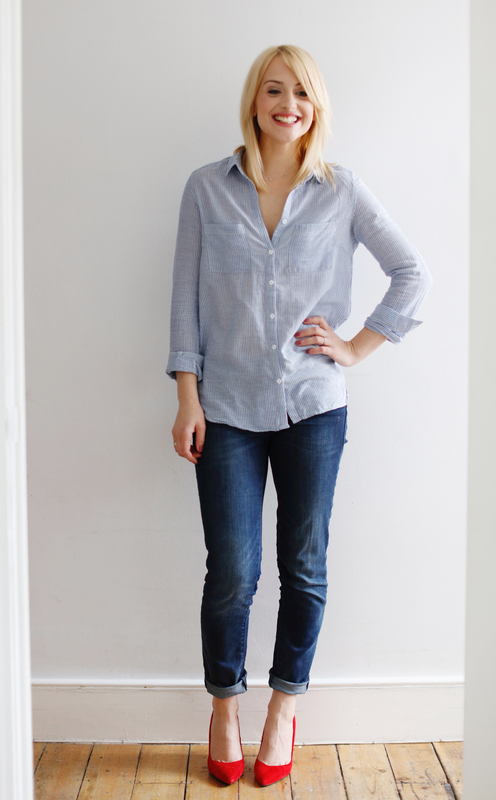 I’ve also mentioned my love of ‘girlfriend‘ jeans with their mid rise and slim leg that gently tapers to the ankle for a relaxed fit that can be dressed up or down with ease, just like the trusty skinny. I’ve also worn these jeans with school-run-friendly Ash boots (also seen here) and last year’s low-heeled UGG boots (also seen here) but I have Kurt Geiger’s Lava trainers on my shopping list. The chunky look of the Stan Smith trainer style works wonders to balance curvy thighs and pairs neatly with relaxed fit jeans, chinos or relaxed peg trousers for minimalist athleisure dressing. The trouser leg should stop just above your ankle for the most flattering length. If you’re over 5’6″ choose Gap’s tall length. You can roll them up more if necessary but too short in the first place and the hem will hit your leg too high (as your leg widens to the calf) and make your legs look chunkier than they are. The same rules apply if you are petite or shorter in the leg. Showing a bit of ankle will actually help your legs appear longer, just keep your turn up thin, too deep and it will shorten your legs. While a high waist on skinny jeans can hold a mum-tum in, on a relaxed jean a mid rise is more flattering to avoid drawing attention to that tummy pooch. As always with jeans, a mid to darker blue wash will slim down thighs while lighter jeans or those with on-trend patch detailing will draw the eye down to the legs and distract from a rounded middle or top-heavy figure.